The DG NACA affirmed that HIV treatment will be made as easy as possible for positive patients to enable them leave a smooth and healthy long life. He made this known while granting an interview to ‘Premium Times’ reporters in his office on Thursday, January 19, 2017. He noted that “a lot of things hinder HIV patients from staying on therapy”. These range from social, economic and cultural challenges, like stigma and so on. However, the DG reiterated the importance of patients’ ability to access treatment and stay on treatment. He further said that NACA is looking at all kinds of interventions that could improve practical and simple mode of treatment. Moreover, he said the Agency is liaising more with other government agencies such as the National Health Insurance Scheme (NHIS). He informed that such synergy will enable NACA incorporate HIV into the NHIS so that people who have already keyed into the scheme can access treatment. 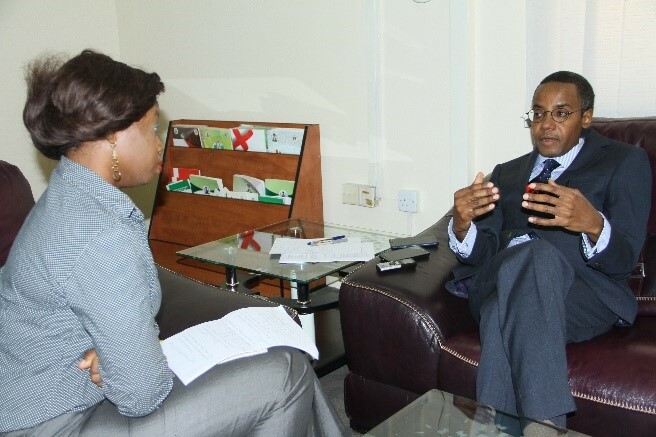 He told the correspondent that NACA under his leadership will operate a very transparent and accountable system, as it is the only way NACA will guarantee support from donors to fight AIDS to finish. From L-R Dr. Dr. Sani H. Aliyu Director General National Agency for the Control of AIDS (NACA), Dr. Isaac Adewole, Honorable Minister of Health, Shirley A. Dady, Country Coordinator United State President’s Emergency Plan for AIDS Relief (PEPEAR). At the Stakeholders Meeting on Surveys and Data Issues in Nigeria held in Abuja. From L-R Dr. Chikwe Ihekweazu, CEO Nigeria Centre for Disease Control (NCDC), Prof. Babatunde Salako, Director General Nigerian Institute for Medical Research (NIMR), Dr. Sani H. Aliyu Director General National Agency for the Control of AIDS (NACA), Dr. Faisal Shuaib, ED/CEO National Primary Healthcare Development Agency (NPHCDA). At the Meeting on Driving the Health Agenda Towards Universal Healthcare held in Abuja. From R-L Dr. Atta Ibrahim, Director Special Duties (NACA), Dr. Chikwe Ihekweazu, CEO Nigeria Centre for Disease Control (NCDC), Dr. Sani H. Aliyu Director General National Agency for the Control of AIDS (NACA), Dr. Faisal Shuaib, ED/CEO National Primary Healthcare Development Agency (NPHCDA), Prof. Babatunde Salako, Director General Nigerian Institute for Medical Research (NIMR), Prof. Usman Yusuf, Executive Secretary and Chief Executive Officer, National Health Insurance Scheme (NHIS), Dr. Emmanuel Alhassan, Director Partnership Coordination. At the Meeting on Driving the Health Agenda Towards Universal Healthcare held in Abuja.